Do you know what defragment hard drive is? Do you know how to defrag Windows 7? Do you know how does defragmentation improve performance? This post will show you the answers and also provide you another program to extend partition so as to improve hard drive performance. Defragmenting is commonly called defragging. No matter what you call it, defragging or defragmenting your hard drive will speed up disk performance. If you haven’t defragmented your PC’s hard drive in a while (or ever), you’re in for a treat. A freshly defragmented hard drive makes your computer seem brand new. It is much related to file systems on electromechanical disk drives, and it is the process of picking up all pieces of data which spread across a partition (it is also called volume) and then putting these pieces together. Maybe it is difficult for some people to clearly know the very process just after seeing the description, so next let’s see a specific example. Now users would know how disk defragmentation works. But at this time some users may ask why a file could be saved to several different locations on a drive rather than stored in one place. Actually, this is our second question of how fragments are generated. Let’s see the following explanation. How Does Disk Defragmentation Improve Computer Performance (Benefits)? Of course, there are lots of benefits to make defragment hard drive. To do defragment hard drive, users need the help of disk defragmenter, and they can use either Windows built-in Disk Defragmenter or third party programs. Here, we just recommend Windows snap-in program since this tool is powerful enough to do the operation. When we are making disk defragmentation, the hard disk will be running at a high speed. If we read or write data at this time, our computer may crash or the entire hard disk may be physically damaged. Defragmentation is much different from other computer operations since the former will make the hard disk spin at a high speed. If users defrag computer frequently (operate hard disk frequently), the service time could be reduced rather than increased. Therefore, it is highly suggested that users do disk defragmentation when necessary. Note that they can analyze disk to see whether defrag is needed or not. Thus, the Space Analyzerfeature of MiniTool Partition Wizard would be a good choice. 3. Had better not defrag the partition which saves system backup. If users make defragmentation for partitions which stores system backup, the backup might be useless. After knowing these 3 aspects, users need to activate the program by doing the following operations: click Start button, type disk defragmenter in the search box, and run Disk Defragmenter as administrator. Windows built-in Disk Defragmenter provides users with 2 options to defrag a hard drive: run disk defragmenter on a schedule or run manually. If you just want to let the program run at a scheduled time, choose Turn on schedule…. 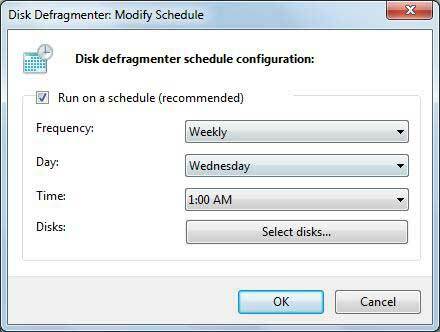 Then, check the box of Run on a schedule, configure defragmentation Frequency/Day/Time, choose disks or drives to defrag, and finally click OK to confirm operations. Select the partition or volume we want to defrag under Current status. 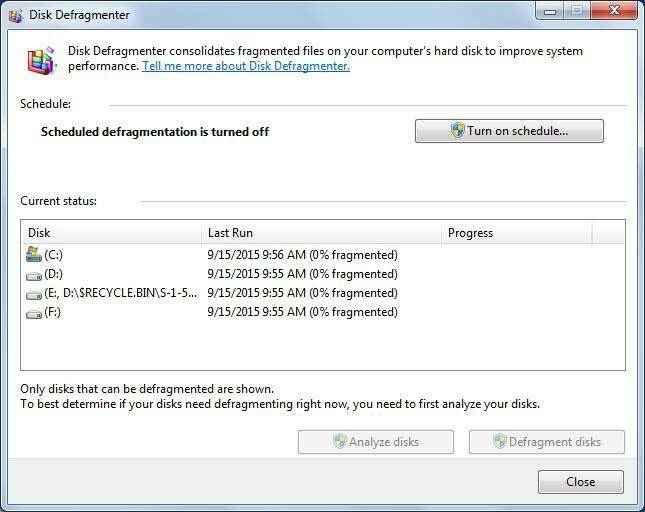 Click Analyze diskto determine whether the drive needs to be defragmented. Only partitions that can be defragmented are shown under Current status. If the partition you want to defrag is not shown there, it might contain errors. Under this situation, please try to repair the partition at first, and then redo defragmentation. For how to repair a volume, please do like this: open Computer, right-click the partition which may include errors, select Properties, and choose Check now under Tools tab. After the analyzing is finished, we can see the percentage of the fragments on the selected drive under the Last Run column. If the number is above 10%, users are suggested to defragment the disk. Of course, when the number is below 10%, users can also defrag the drive, but 10% is the recommended value. If Analyze disk doesn’t work in normal boot, users can try starting computer via Safe Mode: press on F8 when starting computer and then highlight Safe Mode. Windows Disk Defragmenter can only defrag the partition which is formatted with NTFS, FAT, or FAT32. Disk Defragmenter may fail to work when there is less than 15% free space left in the target partition. If users want to do defragmentation under this situation, there are 3 choices available: delete some useless files, transfer a part of files to another drive, and enlarge the target partition. It is believed that almost all users know how to delete a file, but what if all files in this partition are needed or deleting needless files only releases little space? Actually, under this situation, users can try extending the partition by taking free space from other partitions on the same disk though defragmentation had better be made before extending. Besides defragment hard drive, you can also extend partition to improve the performance of the computer and hard drive. Or you can upgrade your hard drive to a larger one. And do you know how to extend a partition without data loss? It is a professional partition manager which is designed to optimize partition and disk use. It can help you to extend partition, copy disk and partition, and migrate OS to SSD without data loss. Of course, it also has many other powerful features. So in order to extend partition, you can download it first from the following button. In order to experience more advanced features, you can choose to purchase an advanced version. Refer to this post for a step-by-step guide on how to extend partition.